We know that some vehicles move faster than others. Even the same vehicle may move faster or slower at different times. Make a list of ten objects moving along a straight path. Group the motion of these objects as slow and fast. How did you decide which object is moving slowly and which one is moving fast? An object is said to be moving slowly if it covers less distance in a given time. An object is said to be moving fast if it covers more distance in a given time. The distance covered by an object in a unit time is defined as speed. Objects are said to be in fast or slow motion depending upon the speed of their motion. Speed varies from object to object, and it can be animate or inanimate. Speed is calculated using the expression. The basic unit for time is second, and it can be calculated in minutes and hours, too, depending on the need. The basic unit for distance is meter. So, the unit for speed is meters per second (m/s). Large speeds are measured in kilometer per hour (km/h). The symbols for units are written in singular form only. For example, the speed of the cheetah is 112 km/h, and Speed of giant tortoise = 0.27 km/h. There are certain events in nature that can help us track time. For example, the phases of the moon indicate the time of the month. There are man-made structures that were constructed to measure time. For example, the Jantar Mantar in Jaipur, which is basically a sun clock, is used to measure time. Water clocks and sand clocks were also used hundreds of years ago to measure time. All mechanical clocks used oscillatory motion to measure time. If you did not have a clock, how would you decide what time of the day it is? Have you ever wondered how our elders could tell the approximate time of the day by just looking at shadows? How do we measure time interval of a month? A year? Our ancestors noticed that many events in nature repeat themselves after definite intervals of time. For example, they found that the sun raises everyday in the morning. The time between one sunrise and the next was called a day. Similarly, a month was measured from one new moon to the next. A year was fixed as the time taken by the earth to complete one revolution of the sun. Often we need to measure intervals of time which are much shorter than a day. Clocks or watches are perhaps the most common time measuring devices. Have you ever wondered how clocks and watches measure time? The working of clocks is rather complex. But all of them make use of some periodic motion. One of the most well-known periodic motions is that of a simple pendulum. A simple pendulum consists of a small metallic ball or a piece of stone suspended from a rigid stand by a thread [Fig. (a)]. the metallic ball is called the bob of the pendulum. The diagram shows the pendulum at rest in its mean position. When the bob of the pendulum is released after taking it slightly to one side, it begins to move to and fro. The to and fro motion of a simple pendulum is an example of a periodic or an oscillatory motion. The pendulum is said to have completed one oscillation when its bob, starting from its mean position O, moves to A, to B and back to O. 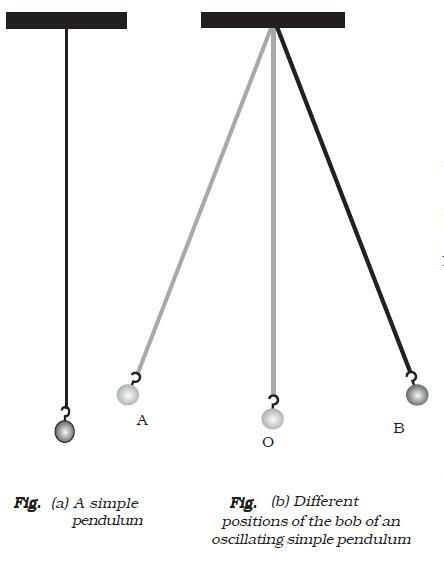 The pendulum also completes one oscillation when its bob moves from one extreme position A to the other extreme position B and comes back to A. The time taken by the pendulum to complete one oscillation is called its time period. It is the time taken for one full oscillation. The working of a pendulum clock is based on the time period of its pendulum. Winding clocks and wrist watches developed from modifications to the pendulum clock. A quartz clock is more accurate than other clocks because its oscillations are regulated by a quartz crystal. An odometer is a device on vehicles to track the distance covered. Objects that move in a straight line and maintain the same speed throughout the distance covered are said to be in uniform motion. Objects that move in straight line and whose speed varies are said to be in non-uniform motion. to cover that distance. Its basic unit is metre per second (m/s).